Sump and Sump pump garden drainage explained. A sump pit is simply a large hole dug in your garden lined with concrete or a purpose made liner and is used to collect rainwater that has been channeled through French drains or a Perforated pipe garden drainage system to be pumped away. A sump is essential in collecting water for some land drainage systems where the area being drained slopes away from the house drains or it's not possible to connect into a soak-away because the subsoil is clay and a soakaway won't work. How to build a garden drainage sump pit instructions for are at the bottom of this page. 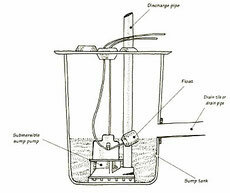 A sump pump, is a submersible pump with a built in float switch that pumps out "dirty water" collected in the sump (or basement) to a drain or suitable dispersal area and automatically cuts out when there is no water left to pump, used to pump the water from the sump into a drain or suitable area where it will disperse. Guide and technical stuff to help select the correct pump and equipment at the bottom of this page. A sump pump, is a submersible pump with a built in float switch that automatically cuts the power to the pump when there is no water left to pump. Purpose, used for pumping out water that is being drained into a sump pit from a French drain system. Dirty water the pump should always be able to pump dirty water - this means water containing grit, sand, mud and small pebbles. On/Off switch It's always best to fit a submersible sump pump with a controller, normally a plastic or rubber floater that automatically switches on and off as the water rises and falls. Sump-cover It's also a good idea to fit a strong removable cover over the sump pit for easy access to the sump pump and to stop the kids falling into the sump. Discharge hose You will also need to connect a hose to the pump to pump the rainwater into the surface drainage system. The sump pump hose can be run over the top of the lawn or garden to connect into the surface water drainage system but can be a nuisance when mowing the lawn or even a hazard for kids playing on the lawn. The pump hose is best buried under the garden or lawn. If the discharge hose is to be laid under the surface. The hose will need to be long enough to run from the pump to the discharge area. A non return valve fitted to the hose to stop the water flowing back into the sump pit wasting electricity. Once you have purchased the pump, I recommend contacting a specialist discharge hose supplier who will be able to advise on the correct "underground" hose fitted with a non return valve to fit your pump. Discharge hose laid over the surface. A simple "lay flat" hose can be used if the hose runs over the surface of the lawn and is not buried. Measure the rise, that's the height difference between the sump and the point the water is to be pumped too, add to the run. Check the pump has an on off switch. The two sump pumps I have selected below are pumps I have used when installing drainage and meet all the criteria, I/E rise, pumping distance, dirty water and automatic on off switch. I use the 69690 sump pump costing around £150.00, it will pump dirty water over long distances from the sump to a drain. 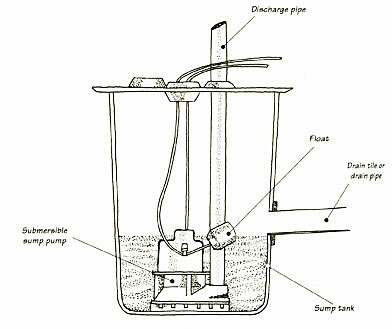 A submersible dirty water pump with float switch. Designed for heavy-duty applications such as, pumping out sump pits over a long distance, inspection pits, ditches and footings where solids may be present as well as general irrigation. Ceramic shaft for long life, thermal overload protection and float switch which automatically turns the pump off when water level has dropped. Supplied with 10 m (approximately) of cable and approved plug. Ideal for pumping out slower filling sump pits over a distance of up to 8m, where suspended solids may be present, Ceramic shaft for long life, thermal overload protection and float switch which automatically turns pump off when water level has dropped. 10 m (approximately) of cable and approved plug. Designed for use with the Draper submersible water pumps featured here. This High capacity 10m discharge hose is compatible with submersible pumps when running the hose over the surface and can be purchased with the pump. A bit more technical information to help select a suitable drainage sump pump. Head and Flow Rate. The ability of a pump to pump is shown by its head and flow rate. The head is the maximum height to which a pump can pump water. In the UK most pumps are sold with the head specified in meters or feet. When selecting a pump you need to measure the height difference between the sump and the point the water is to be pumped too. The head of the pump must be at least 25% greater than that measured distance. The flow rate is a measure of the amount of water that can be pumped by the pump. This flow rate falls when water is pumped upwards. See the sump pumps above and select the one that meets all the criteria, I/E rise, pumping distance, dirty water and automatic on off switch. Sump discharge Hose and accessories. If the discharge hose is to be laid under the surface. Hose clips and connector to join additional lengths of hose if required. The hose will need to be long enough to run from the pump to the discharge area. A non return valve fitted to the hose, this stops the water flowing back into the sump pit, wasting electricity. A "lay flat" hose can be used if the hose runs over the surface of the lawn and is not buried. If you are burying the hose once you have purchased the pump, contact a specialist discharge hose supplier who will be able to supply the correct hose fitted with a non return valve to fit your pump. How to build a sump pit for draining a waterlogged garden. If you have a waterlogged garden or lawn, as described on my garden drainage page and can't drain the water into the surface drainage system because the garden slopes away from the house, a sump pit and pump at the lowest part of the French drainage system is your best option. These systems are cost effective, low maintenance and activate automatically to remove the water. Work out the best place to dig the sump pit. This will be the lowest point of your garden or lawn and always where the surface water puddles. Remember you are connecting French drains and water will not travel uphill. Dig the sump pit 27 to 36 inches deep and 24 inches square to allow for the concrete lining. Check the sides are smooth and free from rocks or roots and the bottom is level. Build a wooden frame to fit inside the pit. Pour in concrete to form the walls of the garden drainage sump, allowing at least 3 inches on all four sides. The top should be level with the lawn or a couple of inches below if you want to hide the lid under decorative gravel. Add a small strip of 1-inch wood to the top edge of the frame. When the concrete dries this will form a lip around the top of the sump pit to support the cover. Mix the cement, following the manufactures instruction for a fairly thick mix. Now pour the concrete around the outside edges until it is flush with the lawn, then pack it down, remembering to add any additional amount needed and smooth it out. Allow the concrete to set for a minimum of 24 hours and then remove the frame or leave it in place. Fill the bottom 4" with at least 20m gravel. Pea gravel could block the sump pump. How to connect into the Sump Pit. When the concrete has set, drill a circle of holes and tap the center out. Another way is to 1, Dig out the first part of the trench leaving a section of soil about 6 inches thick to hold the concrete back. 2, Pour in the concrete and let it partly set. 3, tap a section of the right size pipe through the earth and soft concrete, untill it hits the timber frame. 4, Let the whole thing set and remove the frame and section of pipe. Make sure the pipe is set at the bottom of the trench but high enough up the sump pit to allow room for the pump and float. Fit a wire filter over the trench side of the pipe to stop gravel falling through. This can be made from chicken wire. Do not concrete the floor of the pit, the more water that soaks away the less electricity you will use. If you plan for more than one trench to drain into the sump, if the slopes allow, connect them into the main trench, it's easier than trying to connect them into the sump. Drainage services in Somerset, Devon, Dorset, Hampshire, Surrey, Berkshire, Oxfordshire, Gloucestershire, Buckinghamshire, Wiltshire, Midlands, South Wales, West London, North and Central London.